What is A Portable USB Oil Diffuser From Technical Parameters Aspects? 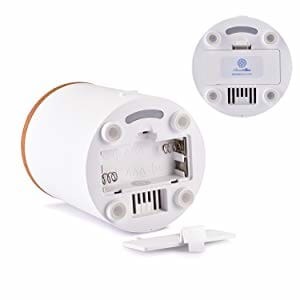 AromaAllure Portable USB Diffuser is a waterless, fan diffuser which applies ventilation method to create airflow, evaporation of essential oil is achieved when air passes over the pad holding the essential oil and quickly permeates essential oils to clean the air, improve the mood of user and even provide real health benefits. The compact model is small enough to take with you everywhere, yet powerful enough to turn your personal area into a pleasant place. 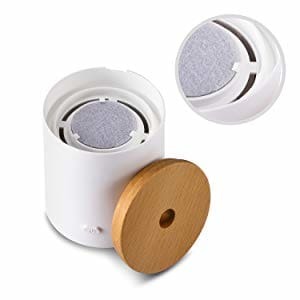 Its quiet operation and warm discreet light creates a tranquil ambience permeating with a lovely scent, which can yield a haven of peace when you are working or sleeping or meditating. A signature authentic wood cap offers the convenience to change the scent pad or add in essential oil from the top, while delivers a zen-feelings to the application area as it reminds you of the scents and touch of nature. Like it is said - Aromatherapy on-the-go - use your imagination to expand its use. Bring it with you wherever you go, thanks to its palm size and battery-operated features. Two pieces of AAA-type battery brings you a comfortable yet convenient aromatherapy no matter where you are on a plane or a train. It diffuses for 30-minute then stops when using battery power. Blending your own fragrance is so easy as putting your favorite oils on the pads. Keep each pad with different scent seperately, change the scent pads as often as your wish. Comes with 3 absorbent pads. Extra pads can be purchased seperately. - Never worry about accidental spills when using in the car, office desk or closet. 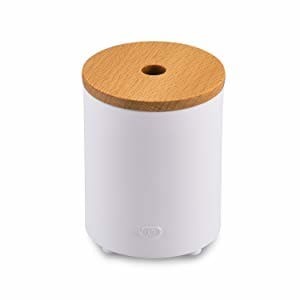 Palm-sized aroma diffuser ideal for gifting and personal use, eg. besides computer, desktop, small room, on the plane or train, etc. Included: 1 x diffuser ; 1 x USB power cord; 1 x Manual ; 2 x extra pads and a hassle-free after sales guaranteed. Manufacturer guarantees for 90 days after day of purchase.